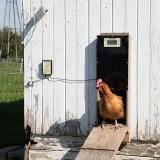 Automatically lets your birds in and out of the coop. 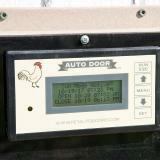 Door can open/close at preset times or operate based on the local sunrise and sunset times via GPS. 110v operation with battery backup. 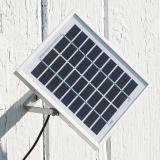 Optional solar kit enables it to run if no AC power is available in the coop. Sealed gearbox and bearings to keep out dirt and moisture. Bottom case dimensions for inset mounting: 6-1/4" x 3-3/4" x 2 1/8"
Overall case dimensions:6-3/4" x 3-3/4" x 2-5/8"
Battery: 6v, 2 Ah, (4x AA) alkaline (non rechargeable), battery holder located in case. 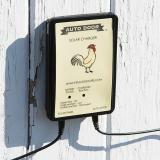 Charger/Battery Case Dimensions: 5.5" x 3-7/8" x 1-1/8"
We bought this door for our convenience, not the chickens. That's how I justified the price. Love it. Works great. Easy to install and program. This product is life changing! The settings are a little tricky to figure out but the guide is simple to follow and once you become familiar with it its very easy to configure your settings. I absolutely love it! I bought one of these doors for my coop and I really like it. 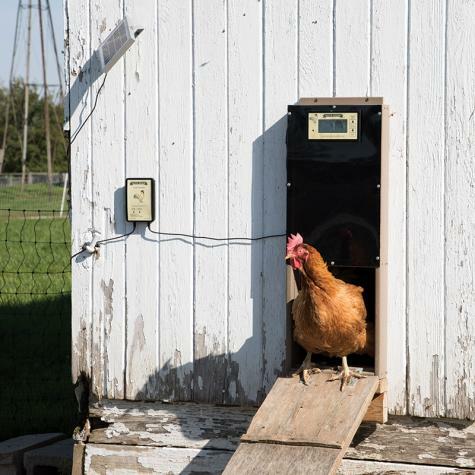 I sometimes travel for work and it's nice that my wife doesn't have to go out first thing in the morning or late in the evening to open and close the coop door. Just bought another one for a second coop I just built.